Play Moneyball daily fantasy sport for the JLT Series. Footy is back this weekend with the JLT Community Series and so is Moneyball with some big guaranteed prize pools. 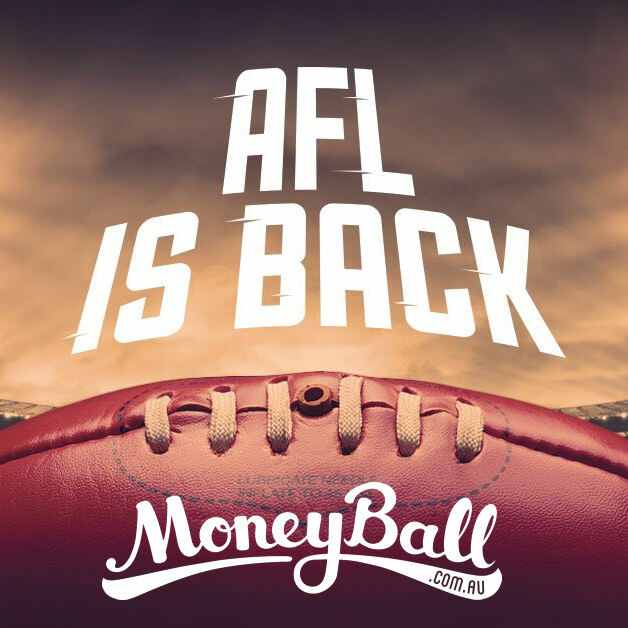 Now into it’s third year, Moneyball is the longest running daily fantasy sports platform in Australia. It covers plenty of sports from Big Bash League and NRL through to big US leagues such as NBA and NFL and of course AFL. DFS is simple, fun and doesn’t require season long commitment. You pick your nine players under the $60,000 salary cap, pay your entry fee and if you finish high enough against the competitors in any given contest, you walk away with real cash – right then and there! Click here to register now for Moneyball and have a try at the FREE ROLL contests available. Moneyball is a game by the fans, for the fans. They have listened to the feedback during the off-season to add a few tweaks to the game – which has been well received in the DT Talk community! First up is the new FLEX position. Basically, your ninth player can now be selected from any of the four positions (forward, midfielder, ruck or defender) which opens up some different choices that might be employed game-to-game. Most of the time you’re select a midfielder, but will that always be the right choice? The big change that we are loving is the NEW SCORING. The good folk at Moneyball has introduced a new scoring system… but if you are like us, it’s nothing new! It’s the good old Fantasy scoring system that we have been playing with for about 15 years. Simple. Tried. True. No more learning a different formula. The numbers that rattle around in our head 24/7 are the same ones that we’ll be using playing DFS with Moneyball. To open up the JLT Series, Collingwood take on Essendon at Etihad Stadium. The squads have been named, but remember you can make changes right up until the 7:40pm AEDT lockout. The key to picking a good DFS team in the JLT, as we learned last year, is making sure you’ve got guys who are likely to get plenty of time on ground (TOG). For example, we’re tipping a lot of the returning banned Bombers might have limited game time as they are eased back – so possibly avoid a Heppell. Instead, look for guys who are knocking on the door of selection. Especially in this first week. Maybe Andrew McGrath gets a decent run to see where he is at? A cheap Will Hoskin-Elliott you would think will be given a chance to showcase his wares as he is heading towards a round one spot. With the pricing of players – and how clubs will use guys – there is plenty of value. Really, look at who you think is going to be out there for the most minutes – and like all Fantasy – who will have the opportunity to play around the ball and rack up some points! Watch the coverage, listen to coaches and absorb whatever comments you can to see if you can get some idea of who might be playing bigger minutes and fantasy friendly roles. Stay tuned to our @DTTALK twitter account as we’ll provide some tips to help you pick a team across the weekend. Click here to register and play now. Check out AFL Ratings (aflratings.com.au) for some of the best daily fantasy content on the net. Pete is very active on Twitter and you will learn a lot if you listen! He’s all about educating people in the game! Also, DFS Australia (dailyfantasysportsaustralia.com) is a new resource which provides statistical analysis of daily fantasy sports – including NFL, NBA and AFL. Check it out. Tell Morts we went you! He’s a great guy and has also been a huge supporter of DT Talk over the years.